It’s Shirley Bee’s Birthday and I was invited to join in and share her special day with a Linky party hosted by Maria F. Thank you Maria for organizing this and asking me to join in her Celebration! I am not only a fan of Shirley’s work, but I also have the pleasure of working alongside her on the Seize the Birthday Design Team. I have been trying my hand at watercoloring techniques more and more these days (as Shirley so creatively does, and makes it look so easy), so here is another one in honor of her Birthday! Happy Birthday Shirley and thanks for inspiring all of us along this creative journey! 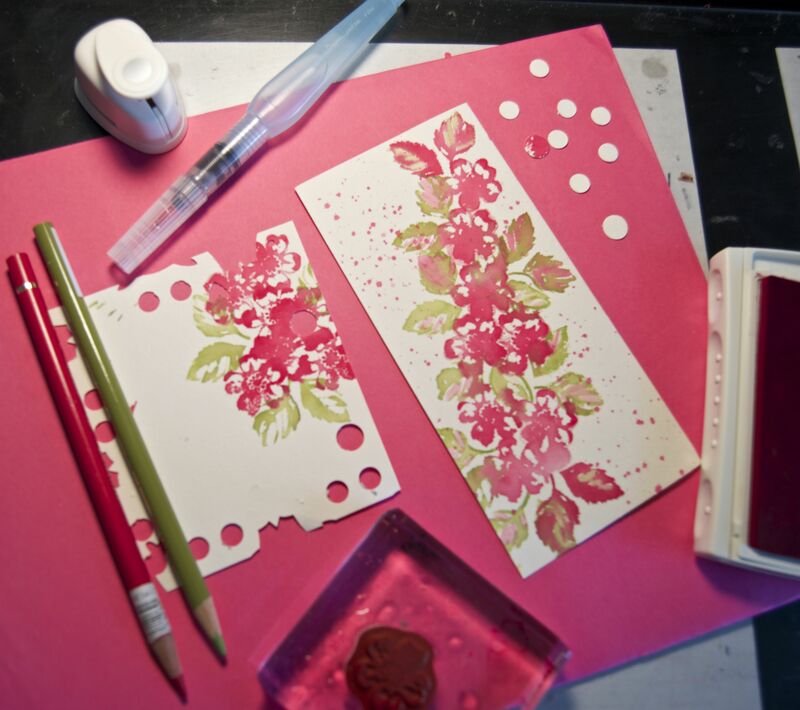 I started off with a piece of watercolor paper and stamps from SU Stippled Blossoms. I stamped the leaves and the flowers using the spritzing technique. Things were moving along swimmingly, until I was about to stamp my last set of leaves and accidentally put the leaves in the Melon Mambo ink instead of the Lucky Limeade $#$%%*. My sentiments exactly!! It’s the pair of leaves on the very top of the card. Luckily, I liked the look of it and decided to add some more pinkish- red leaves. Love when things work out like that! I came back with my watercolored brush and added some very light Melon Mambo inside the green leaves. I decided my flowers and leaves needed a little fine tuning so I took some colored pencils and added some definition. You might not even be able to tell where in the photo. Then I thought the inside of the flowers were lost as you can see in the photo below. So I punched out some circles and stamped them with the same flower and adhered them to the card with a tiny cream center. I speckled the card with some more Melon Mambo and added the Vellum heat embossed Hero Arts Sentiment. All card stock is Stampin Up along with the candy dots. I am also linking this card to the Mod Squad challenge where my friend Judy is hosting. She asked us to create your most very favorite kind of card. Well, this card covers Two of my favorite things. I absolutely love making tall and skinny cards! Honestly, they have always been my favorite. Also, I am so enjoying watercoloring at this point in my creative life. It’s so free and unplanned as you might have realized if you read my steps above. LOL Thanks Judy for letting us do what we love with no limitations! Thanks for stopping by today…I so appreciate it and please come on over to Maria’s Blog and see the various Birthday cards we have linked up for Shirley’s party! Categories: Cards | Tags: Card making, Cards, Happy Birthday, rubber stamps, stamping, Watercolor Spritzing, watercoloring | Permalink. Love your pretty watercoloring card. Nice colors. I kinda like the pink leaves too. Great job. Shirley is such a talented crafter, and clearly so are you! Wow! This is a stunning use of watercolors and I love the tall and skinny layout. Thanks for sharing your talent! Well, this would be called serendipity!!! I absolutely LOVE how this all turned out. The Melon Mambo leaves are perfect – what a surprise. this really does look awesome!! I think your card is just beautiful! 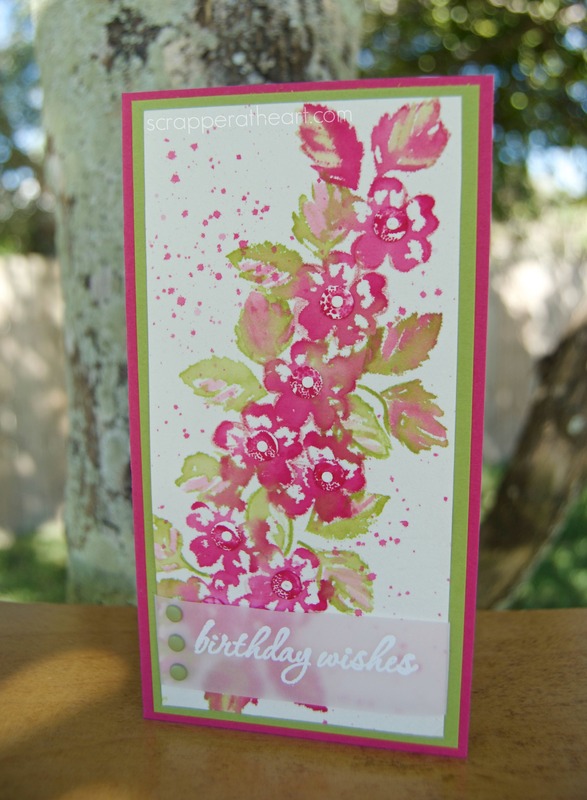 The tallness of the card, the spatters, the beautiful floral image, your colors – everything just goes so well together! Well done, thanks for joining us this week on the Mod Squad! This is one beautiful card! You have out done yourself! I love the pink in the leaves, and that flower stamp is awesome. Really lovely! Oh my – you are doing fabulously with water coloring! Love this card! THIS card is a work of ART! FABULOUS watercoloring and I LOVE the colors (my FAV combo!) and your design! Just Spectacular! What a gorgeous card you created. I just love it! Your card is awesome with the stunning painting! Shirley will love your splatters! Wow, Nancy, this is gorgeous. I noticed the pink leaves and thought “what a great idea”. That’s what my hydrangea leaves look like right now! Thanks so much for coming to Shirley’s party. That wasn’t a mistake, Nancy, that’s nature! Love, love, love those pink and green leaves. And the splatters, of course! Thank you so much for joining the linky party and helping celebrate my birthday! Well that’s just gorgeous! I like the leaves at the top done in the ‘wrong’ color, they still look beautiful too! This is so stunning! I wish I could watercolor like you! BEAUTIFUL! I think you did Shirley proud, Nancy. Your watercoloring looks great and I love the variegated leaves and splatters.